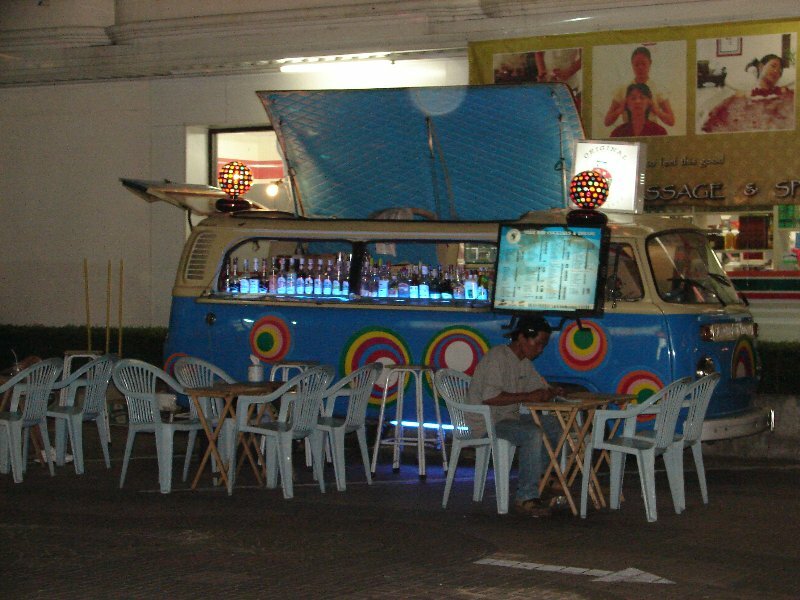 In Pattaya there are a pair of VW buses that are actually fully stocked bars complete with their own sound system and disco lights. This picture was taken in October of 2006 in front of the LK Metro. Another VW bus of the pink variety can be spotted around town as well. Apparently they were both owned by partners that sadly had a fall out which led to the dissapearance of the blue bus for a while but I hear it’s back in circulation. Ingenious idea that I’m sure has made some very good money which probably led to the partners fall out. All I know is both buses make a helluva good vodka lippo! That’s pretty sweet. I wish we had the same thing here. That might be dangerous. LOL. They look like Ex Hippie camper vans. If I visited Thailand I would not be averse to having a drink there. It looks like open air fun. That is so cool! Now I definitely want to visit Thailand, Talen! fragilehearts last blog post..Is there anything Entrecard can’t do for my blog? Hi Talen! That’s so great - the bar coming to the people… I am sure lots of bar goers will love that! I wonder if that would be legal over here in the States. Probably not, for a number of reasons. very fantastic….globalization is come trough anywhere, every side of life.